In front of the Hyoja community service center, just 200 meters away from the presidential office in Seoul, some 3,000 parents and volunteer workers took to the streets to demand support for people with developmental disabilities on Monday. 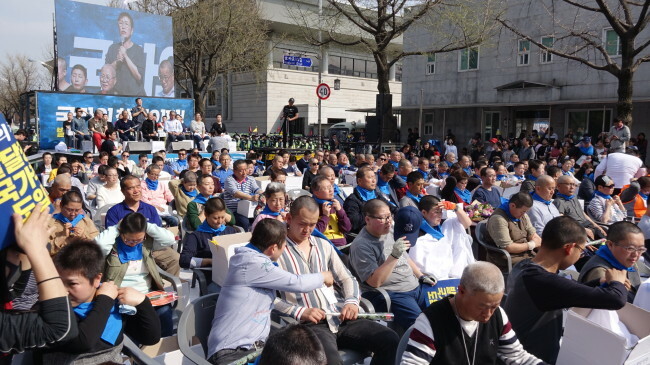 During the rally organized by Korean Parents’ Network for People with Disabilities, 209 parents and activists also shaved their heads, in the hopes that their pleadings will be better heard and seen by the government. “We are parents who have to take care of our children 24 hours every day, until they grow up and die,” Yoon Jong-sul, the head of KPNPD said on a makeshift stage. The protestors called for a state-managed program, including day care services and job opportunities for people with the developmental disabilities. The Act on Guarantee of Rights of and Support for persons with developmental disabilities was enacted in April 2014. But the parents‘ association claim nothing has changed. While at least 42.7 billion won is needed to implement the law, this year’s budget planned for developmental disorder support appears to be 8.5 billion won, which is 500 million won less than last year, planned by the previous government. They also urged President Moon Jae-in to keep his campaign pledge to provide various support for those suffering from developmental disorders, such as policies to protect their human rights, establishing facilities for daycare services after they become adults, and offering ways for them to earn an income. Currently, the schooling and day care services are provided for those under 19, meaning that families lose all state support once their child becomes an adult. At the crowded rally, some families were seen holding the hands of their developmentally disabled children. Jeon Kyung-mi, a mother of a boy with a grade-one developmental disorder, told The Korea Herald that the state should come up with systematic policies to support the families. “The difficulties we face nurturing children with developmental disabilities is similar to that of dementia patients, but it is different in that they occur at a much younger age -- from their birth,” Jeon said, adding that the siblings are also pressured by the idea that they would have to take care of their afflicted brother or sister when the parents die. Jeon was among the 209 members who shaved their heads. Her friend is not the only one. There have been several cases where people have taken their own life after being heavily burdened in providing for a developmentally disabled family member. In 2014, two parents killed their 5-year-old son who was suffering from a developmental disorder before taking their own lives in Gwangju. In 2015, a woman killed herself in Daegu as she faced difficulties supporting her developmentally disabled sister. 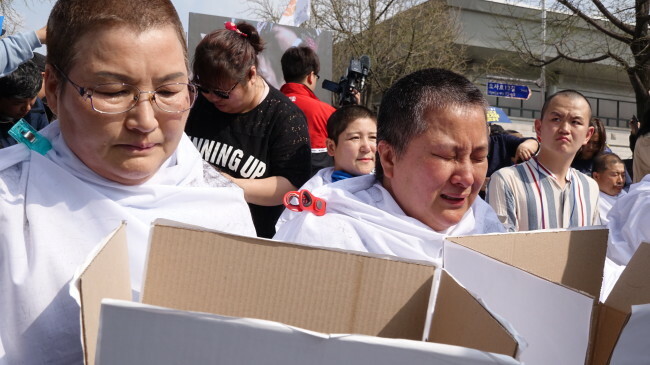 “All we ask for is to have our precious children live a normal life, and be able to live in the world by themselves when we, the parents, die,” Kang Seok-gu, a mother of a son with a grade-two developmental disability said, before her head was shaved. Do Woo-kyung, a mother who traveled from Busan -- some 400 kilometers from the capital city -- said the society in which people with developmental disabilities live is entirely different to the society where other people live, and that is why the government should stand up for the minorities. “These developmental disorders do not allow the children to obtain skills fast enough to allow them to live in this society. While there should be no discrimination among disabilities, those suffering from brain damage and their families live in an entirely different society,” she said. The mother, who has a 15-year-old son suffering from a grade-one brain lesion, also said brain lesions should be categorized as a developmental disorder and those afflicted should also be supported. The rally organizers held a “Light It Up Blue” performance to honor the day, as April 2 marks World Autism Awareness Day and has been recognized by the United Nations since 2007.